Tires are an important part of every automobile. They bear the car's load, absorb shock and provide traction. In addition, tires transmit handling (acceleration, braking and cornering) to the road. The tire also acts as a spring between the rim and the road. Because tires provide such a vital function, it's essential that owners maintain the correct amount of air pressure in their car's tires. In fact, proper tire inflation is the most important factor in caring for tires. Many people mistakenly believe they should inflate their car's tires to the levels listed on the sidewall of the tires. But the number on the sidewall is the maximum air pressure for the tire, based on the tire's maximum load capacity. The correct air pressure for tire inflation is the one recommended by the car's manufacturer. This air pressure level can be found on the car's door jamb and in the owner's manual. There are a number of things that can happen to an improperly inflated tire. Under inflation is the single-most common cause of tire failure, which can happen when a car's tires are underinflated by as little as 6 psi! Underinflated tires can cause a blowout, which results in loss of control of the car and can lead to an accident. In addition, underinflated tires can reduce a car's steering precision and cornering stability, reduce tread life by 25 percent, and cause up to a 5 percent loss of fuel economy. On the other hand, when a tire is overinflated, it becomes stiff and the tire's footprint is reduced. Overinflated tires can't isolate road irregularities well and will provide a harsh ride. When a car's tires are overinflated by 6 psi, they run the risk of being damaged by potholes or debris in the road. 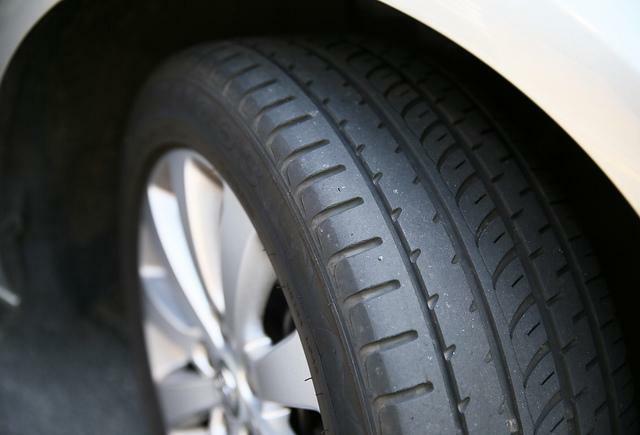 Overinflated tires wear unevenly because most of the car's load is borne by the center of the tread. As a result, the center of the tread wears out faster than the outside. This reduces the life of the tire and increases stopping distances because less tread area is in contact with the road. It's important to check tire pressure every month because tires lose about 1 psi per month, even if the car hasn't been used. If you don't know how you can easily visit a Yarmouth Mazda dealership and get them to check it for you. A tire's air pressure is also affected by temperature. Air pressure can change by 1 psi for every 10 degrees F of temperature change, going up when it gets warmer and down when it gets colder. It's easy to see how tires that were inflated in the summer could lose as much as 12 psi six months later in the winter: 6 psi due to time and another 6 psi due to temperature. The Tire Industry Safety Council is a valuable resource for more information on tire care. They publish an informational brochure, which is also available online. Visit our Tire Fitting Room!